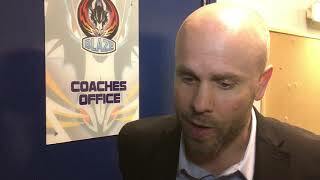 The Genting Casino Coventry Blaze’s season ended with a 2-7 home defeat, and 2-12 aggregate score-line to the Belfast Giants in the Predictorbet Playoff quarter-final. Following an injury to number one netminder Matt Hackett in warm-up, Brit Jordan Hedley was called into action being beaten by Jonathan Ferland first at 10.43. Former NHLer Jim Vandermeer made it 0-2 (12.59) before Jordan Smotherman scored the first of a hat-trick on (19.58). In period two another Giants goal from Dustin Johner (21.03) was followed by two from Coventry. 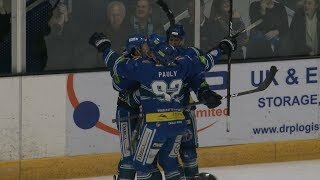 Shawn Pauly first scoring on the powerplay (26.27) before Blaze’s top goal and point scorer Ben Lake made it 2-4 on the night and 2-9 on aggregate (30.37). In the final twenty minutes of the season for Blaze, Smotherman completed his hat-trick (41.14 and 58.03) with Blair Riley wrapping up the scoring (59.31) for a final score of 2-7 and 2-12 on aggregate.